Irving Berlin’s Top Hat Tour has been tweaked with new songs added prior to its transfer into the Aldwych Theatre next month. It is about to embark on two more tour dates this month at Woking and Bristol before it starts previews in London's West End in April. 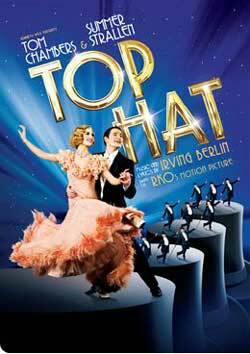 It stars Tom Chambers and Summer Strallen in the roles originally played in the film by Fred Astaire and Ginger Rogers. Tom is an ambassador for the Starlight Charity and there is a special charity night of Top Hat the Musical at the Aldwych Theatre on Thursday 19th April at 7:30 pm. Tickets are £95 for top seats and an after show champagne celebration with the cast. Starlight brightens the lives of seriously and terminally ill children by granting them once-in-a-lifetime wishes and providing entertainment for children in hospitals and hospices throughout the United Kingdom. All Starlight’s activities are aimed at distracting children from the pain, fear and isolation they can often feel as a result of their illnesses. Brilliant show. Saw it in Birimingham last august. Incidentially, it is going to Bristol, not Birimingham, although I wish it was coming up again. It is one of the best shows I have seen of that style. I hope this is the first in many musicals in this style. Bring back the classic 30s musicals. I saw the show last year and loved it. Will certainly be seeing it again in London to see what changes have been made. Sorry about Birmingham - it says Bristol on my web page. Was obviously more tired than I thought when I wrote the blog! Duly amended. I haven't heard what new songs yet either. All I know is that there is a new opening song. I hope there will be a well deserved cast album.